Headspace Studios is a Digital Video studio working in HD format. We can author in 5.1 surround. We own our equipment and thus we are a vertical independent (Guerrilla) operation, able to cover all aspects of Digital Video production: from the planning to the shooting, editing and post-production. We output to any format or media type. From cellphone to Digital Cinema, we evolve with interesting projects. At the moment Headspace is producing a full-length feature draft titled, 'Cognition Factor'. 3D cameras are next, so stay tuned. Ignore the boring stuff like ordinary corporate jobs but we've produced a number of cool Indie shorts and short in-house science movies for South African Large Telescope, so some of the history below may confuse you. But go ahead if you must. 1998 - Headspace Studio is formed and gets contract to provide management, content and technology for M-Web's online multiplayer gaming community, the first of its kind in Africa. 1999 - The contract with M-Web is refined into a deeper relationship. Meaning, we get paid more. In October I travel to Hawaii to interview and film Terence Mckenna at his last conference. 1999 - Remember millennium psychosis? Headspace Studios teams up with M-Web to successfully broadcast "The Webtrance Millennium Experience", an experimental video show streamed over the net at millennium midnight 1999 from four dedicated media servers to a worldwide audience. 2000 - Valentines Day - Headspace webcasts the world's first online Quake wedding from our studio for M-Web. This is noted by both national and international media. M-Web's gaming site gets 80,000 visitors on this day. 2000 - July - We are guests of the Grahamstown Film Festival where our five-minute movie on mp gaming is screened over national TV at the same time. 2001 - Continue playing Counterstrike for M-Web. In March we produce a short experimental movie for the Lucky Strike Film festival and the OppiKoppi Film Festival. 2001 - July. We travel into the Cedarberg Mountains to capture unique footage of the local San. 2002 - February. M-Web contract ends and we can finally stop playing online games 24/7 for a living. Headspace is now part of the Indie film movement in Cape Town. Our '60 Seconds' movie (download 2MB .wmv) wins an award in a South African short film competition. 2002 - June. We exhibit an 'African' experimental movie on widescreen DVD at the Polyphonix International Festival of Polypoetry and Multimedia Art at the Centre Pompidou in Paris in Paris, France. 2002 - December. The Solipse Caper. Schlepp crew to to Limpopo Province in the North West Province to film a rare solar eclipse. Unfortunately, we do not get to see the eclipse due to extreme weather conditions. 2003 - February. Film and author a movie for Dunhill International to promote newly opened smoking lounges at international airports. 2003 - March. Film and author our first media project for South African Astronomical Observatories. 2003 - June. Another short experimental film made for 'Obs' film festival. 2003 - September. Media consulting for Generator Advertising agency. 2004 - February. My partner takes on a caper coding casinos and leaves me with the studio and camera equipment. I continue by an inventory of the Terence Mckenna footage I have. 2004 - April. Cognition Factor. At the beginning I should just add in that I had been looking after my dad, who had been ill, for most of 2003, but it was only some months after he passed away at the age of 92, late last year, that it began to dawn on me that if I could persuade Dennis Mckenna to help me out, maybe I could finish the Terence Mckenna movie I've had on the backburner since 1996. At this time, I did not know and had never met Dennis Mckenna, Terence's younger brother. After sending emails across the globe, I eventually track Dennis down to Minnesota and I persuaded him. 2004 - June. I get on a container ship to Tenerife. Film Tenerife solar observatory. The Tenerife Experiment. The first step. 2004 - July. Holiday on Costa Del Sol with family and await the arrival of Dennis Mckenna. 2004 - August. Continue writing my second book, Lost Planet, in Spain. Film Dennis Mckenna on the Costa Del Sol for Mckenna movie. Go to Ibiza to stay with Dennis's friend, Richard Wolfe of Hi-Vision. The title 'Cognition Factor' is coined by Joey Rothschild at the Temple of Tanit on Ibiza. Go to Edinburgh Book Festival. Meet Iain M. Banks. You can get the detailed travelblogs of all of the above from here. Scroll down to the bottom of the travelblog page to get to the beginning. 2004 - October - December. Begin work on Cognition Factor. Shoot more promos for SALT. 2005 - January to April. Write/Produce/Direct/Film promotional movie for SALT. South African Large Telescope. The largest telescope in the Southern Hemisphere. 2005 - May - Continue production of 'Cognition Factor'. Download teaser of our first full length feature. 2005 - June: Lost Tapes Caper. Film road trip with Dr. M. Scott to recover and digitise Terence Mckenna archive in Joburg to use in upcoming Terence Mckenna full feature production. Also film interview with white sangoma, Dr. David Cumes, at his mountain hideout, Tshishimane, in Limpopo Province for inclusion in 'Cognition Factor' during an epic ten day road recce of five thousand kilometres. 2005 - July: Long Street Café: Art film with Brian Weinronk. 2005 - August: Produce SALT International TV Press release. 2005 - October: Cognition Factor pre-production. 2005 - November - December: Write edit and produce 'True Conversations', a short movie featuring excerpts from 'Cognition Factor', for viewing on Friday 13th January 2006 at The LSD Symposium in Basel on the Occasion of the 100th Birthday of Dr. Albert Hofmann. True Conversations is featured on their website here. (Scroll down till you see 'True Conversations'). 2006 - January: Mike Kawitzky attended, showed and filmed at the LSD Symposium, assisted by Kathy Leseuer and Leo Kawitzky. True Conversations, a seven minute film, was shown at 4.00PM on Friday 13th January to an international audience, taking questions from an appreciative audience about the full length feature currently in production at Headspace Studios. The movie, draft titled, 'Cognition Factor', will ask us to question our current belief structures by sharing the thoughts and hopes of some of the most creative scientists, philosophers, artists and writers of our times. People like Prof. Dennis J. Mckenna, Terence Mckenna, Rupert Sheldrake Ph.D, Alex Grey, Ralph Metzner Ph.D, David Jay Brown, Barry Lategan and Stan Krippner Ph.D, amongst others. Stay tuned! 2006 - March: Travel to Ghana for three days to film total solar eclipse of the sun (29th August) from the University of Cape Coast as part of a South African scientific delegation with scientists from the South African Astronomical Observatory (SAAO). Help with international webcast of live video coverage and capture High Definition video of event. 2006 - April-August: Studio digitising and sorting HD footage for use in Cognition Factor. Film several local interviews with scientists. Receive footage from Dr. Libby Hubbard, aka Doctress Nutopia, Ralph Abraham Ph.D and David Peat Ph.D for use in movie. Interesting how things evolve. 2006 - September: Crew of three Mikes go on 3000 click road trip to Augrabies Falls, which is somewhere near the border between Namibia and South Africa, (southern Kalahari desert), to film some inspiring wilderness for inclusion in 'Cognition Factor'. Mission complete. 2006 - October: Filming canned. Studio working on sorting final sequences, timeline and audio. 2007 - February - August: Look around, it's minus six months - Flash! One minute it was February, now it's August. Six months of crafting intensive 3D Effects/CGI, has just gone by in a flash. Jack Gallagher, our senior 3D effects wizard, finished his last render and suddenly 6 months of making 3D special effects is behind me. 2007 - August: Dr. Alex Paterson, (The ORB), just so happens to be one of my musical heroes, in that his music has provided me with lots of inspiration over the last 15 years, so I find it necessary to track Lx down and get him involved. After all, keeping it real is what Cognition Factor is all about. Some time later, but it could've been longer, I'm having an extended long-distance conversation with Lx in London and discussing his collaboration in the Cognition Factor movie. Bottom line - The ORB are on board! And it's not only ORB who'll be crafting CF's sound track. In the house are also Colin Angus, (The Shamen, Pablo Sandoz), Merv Pepler, (EatStatic), Dom, (Transit Kings), Youth, and hopefully, Steve Hillage playing spaced out gliss guitar, while locally, Mike Martin, (Indidginus), is putting all the sound together, and making more where necessary. So it's not only philosophy and eyecandy you'll be getting. 2007 - September 11th: The ORB hookup online with video and sound from their studio in Ealing, London, to the Headspace studio here in Cape Town, South Africa. Classic. Get a hint of the opening sound-track for Cognition Factor from these ambient masters. ORB big (13 MB) file here. Download only. ORB YouTube Link. Watch online in realtime. 2007 - November: Post production of Cognition Factor complete. 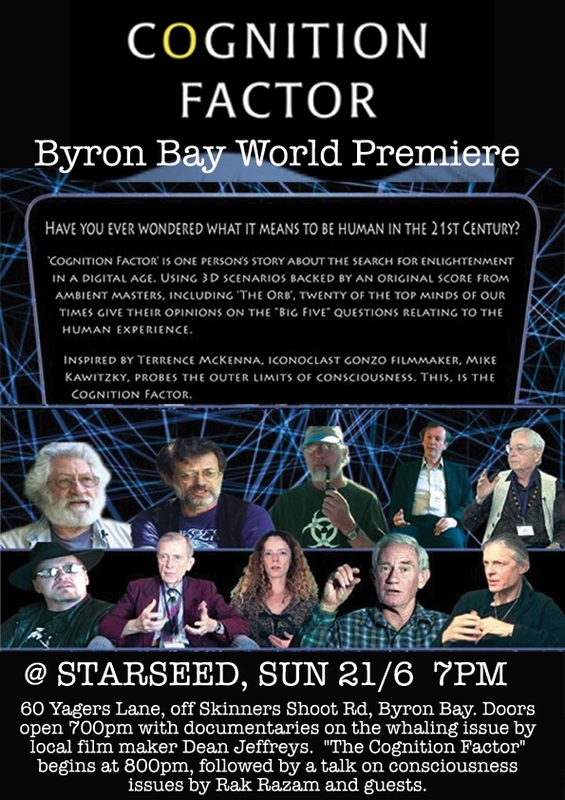 A full-length movie with 20 of the most important thinkers of our age, explores the outer limits of consciousness through the eyes of a cyberpunk seeking answers to the same Big 5 questions that puzzle everybody. As you'll see and hear from the teaser, this film is unlike anything you've experienced before. Maybe this is because we've broken all the rules. The interplay between our interviewees and the subject matter underscored by ambient music seen through our awesome VR interface linked by a unique editing style make this a serious contender for the next cult classic. 2008 - After post-production came marketing. Designed DVD and authored website. Two local sneak screenings were held during which we gauged audience reaction to conscious cinema. Cognition Factor, (CF), was filmed internationally and edited in Cape Town, South Africa at Headspace Studios for release to Digital Cinema, HD broadcasters, HD Blu-Ray + HD Hitachi formats. Soundtrack composition & sound design by Indidginus. (Michael Martin). Additional music by The Orb, Eat Static/Ozrik Tentacles & Pablo Sandoz. Mike Aldridge has performed several roles locally, incl Assistant Director, DOP and script analyst. Jack Gallagher, (The Machine) is 3D effects. Zoe Kawitzky is marketing and product design. But the list of the people actively involved in the project is much much longer than this and the last thing we want to do is bore you, so rather tune to the fact that everyone involved with this project has been of open heart and pleasant disposition. Besides which, no garden gnomes were disturbed during its making. Download the .mov teaser here. (10 MB.) View on YouTube. There are some dynamic blogs dedicated to Cognition Factor on Myspace, TribeNet, FaceBook and movie teasers on YouTube. 2009 June 22nd. You can buy Cognition Factor here. The Cognition Factor website is here. 2009 November - Let's ride! Shooting commences on the 'Ride-about' show. 2010 June 22nd - The 16 minute pilot for 'Ride-about', a 12 part motorcycle travelogue, is test-broadcast on Cape Town TV. See it on Facebook here. 2011 - Exec Producer, Michael (Schwann Cybershaman) Kawitzky, completes an autobiographical novel detailing the above history titled; "Journey to Everywhere". 2011 Videography and HD media production Edit for South African Astronomical Observatory. Brief: Film CANSAT rocket launch at Overberg Test Base near Bredasdorp on the 29th September. Edit and produce HD media used for the opening address of the International Astronautical Conference on 3rd October at the Cape Town International Convention Center. 2011 December - "The Terence Mckenna Omnibus 2012" caper begins. Acronym - [TMOM 2012] - A planned series of 12 clips each, 12:12:12 in duration. Each 'episode' or 'chapter', will deal with a specific subject. Chapter One: "Who Am I?" will be released from the Headspace server via links on the Cognition Factor Forum. It will not be released on FB or YouTube until 12 days later. 2012 January - Chaper 1 - TMOM2012 - "Who am I?" - Released. 2012 From February to November the studio produced one TMOM2012 12:12:12 clip monthly without dropping a stitch. Enough thanks and admiration cannot be heaped upon Craig DeSousa, Carlo (Azmazz) DaSilva and Ernie Vega, each responsible for chunks of the show and credited therein. 2012 December 12th. The 12th and final chapter of the TMOM2012 series - "We are the Eschaton", is released. 2012 December 21st. Live stream broadcast from the Cosmogenesis2012 event in the Maluti Mountains with Dennis J. Mckenna, Bruce Damer, David Gaian, Morgan Russell and Peter Hart Davis, featuring firedancers with lightning-strike background, curtesy of equipment from Stuart Daniel of Universe Direct (DELL), and streaming service from Peter Hart Davis of MWEB. 2013 16th January. Envisaging the "Lost Tapes". More movies and books? Write-up of the chaos that was 2012? Later in 2013! Encourage us to do more by joining our Forum community here!